She is in that rare sphere few designers ever elevate themselves to. Making clothes, which are entirely based on the Zeitgeist, reflections of what’s happening in the world. 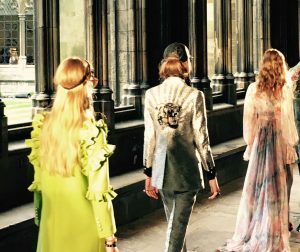 This is what Miuccia Prada does better than anybody else. And this is the fuel that propels her fashion company forward and makes it grow and grow. For her latest men’s show, she unleashed all her anger at the right wing government she has to endure, the poor management of the migration crisis all over Europe, the salary injustice, the emergence of right wing parties all over the world and a crook like Donald Trump as the leader of the free world. 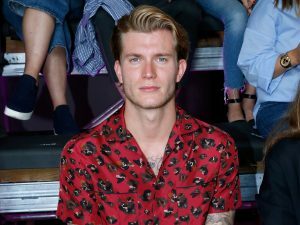 To channel this anger in clothes for a show – and Prada reminded us backstage that fashion has the job to be fun – Prada looked at her favorite horror movie characters and unleashed them on the catwalk. Frankenstein, The Rocky Horror Picture Show and ghosts were all there. Hence, masterly black tailoring to open, shocking color prints which looked like horror movie posters to energize and metaphors galore like the backpacks which were not an outdoor reference but in the show to represent the personal baggage a person collects in life. You can tell a Prada suit from afar. 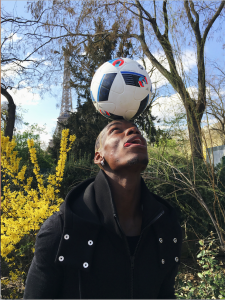 Straight lines, no fuss, strong fabric. 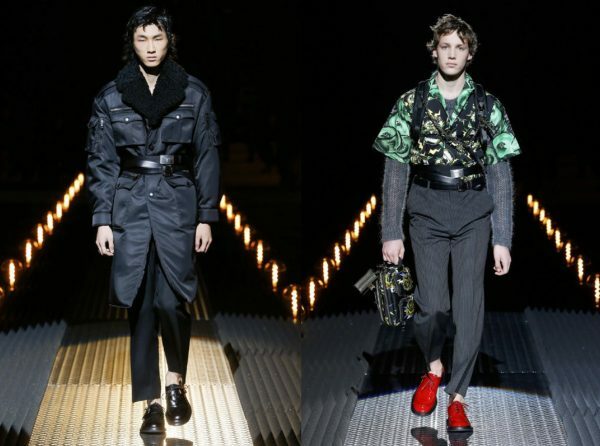 Prada opened with a three-button, single-breasted jacket, naked torso and strongly pleated pants to set the mood followed by strong coats with cool triple belt styling. To make sure the tailoring message was clear, Prada repeated those looks in the mid section of the show and at the end in shiny silks with detachable hearts pins. 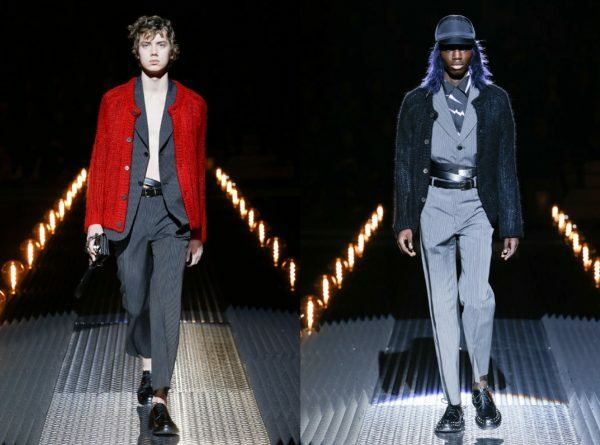 Monochromatic tailoring statement in Prada men’s FW 2019 show first looks. When it’s about expressing power, the silhouette needs to be long and strong. 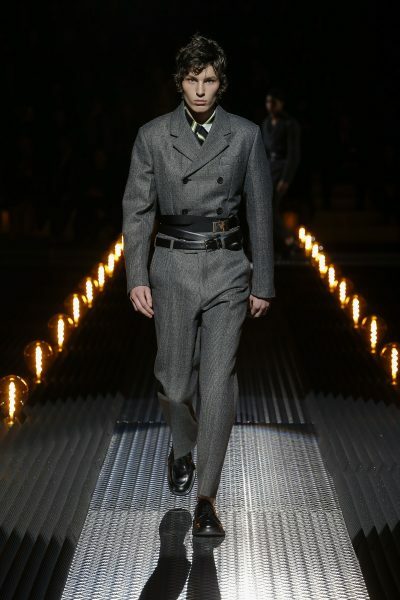 Prada elevated the waist of her pants and accentuated them with triple belts to focus on what’s above very clearly. 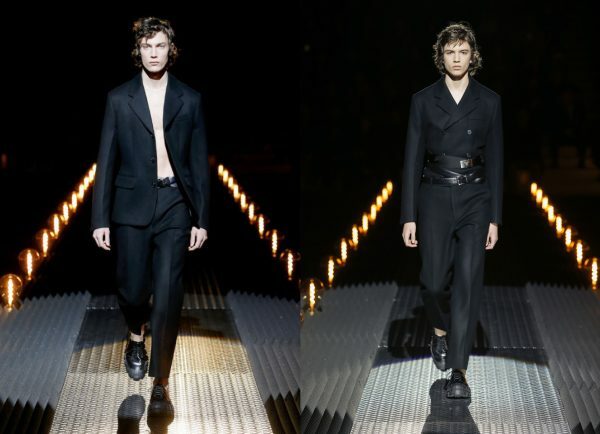 Elegant shaped suits were predominant at the Prada men’s FW 2019 collection. The ultimate expression of layering? Prada’s bomber jacket is the cardigan, the garment of the nerdy outsider. 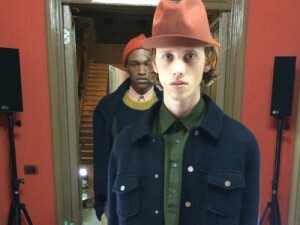 Bombers are everywhere but not at Prada who is too selective to dip into obvious street cred vernacular. So in this show, she layered knit cardigans over her tailored jackets. The ultimate way to style a cardigan by Miuccia Prada. 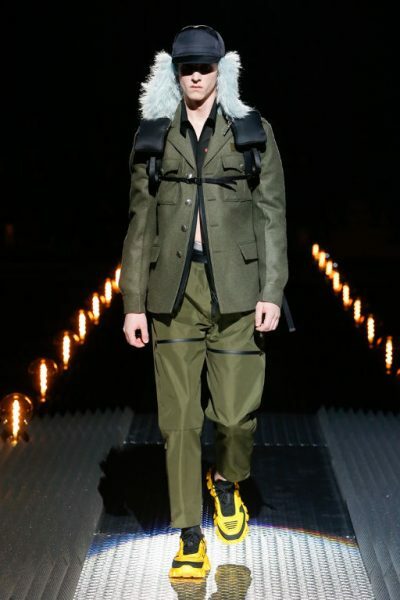 Also, not a brand to use military references, this time Prada used olive military cut jackets to display her love of uniforms. Her multi-pocket parkas in black nylon with astrakhan collars and multi-purpose sweaters with knit bodies and nylon arms were fresh. 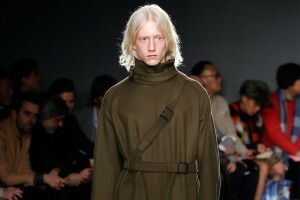 Miuccia playing with fabrics and layers for her men’s FW 2019 collection. 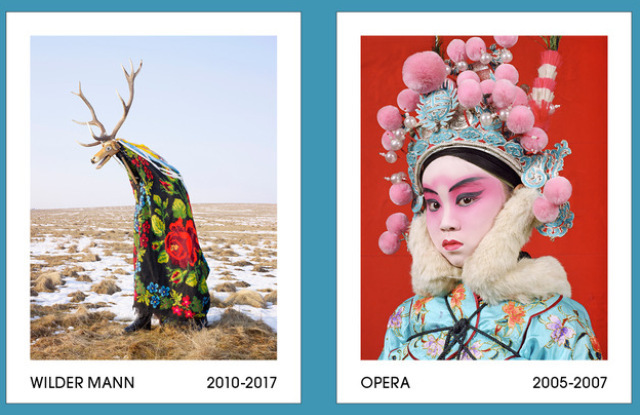 It feels like with this men’s season it’s becoming more than clear that fashion designers who want to stay relevant need to make meaningful interpretations on what’s happening in the world through their clothes and events. 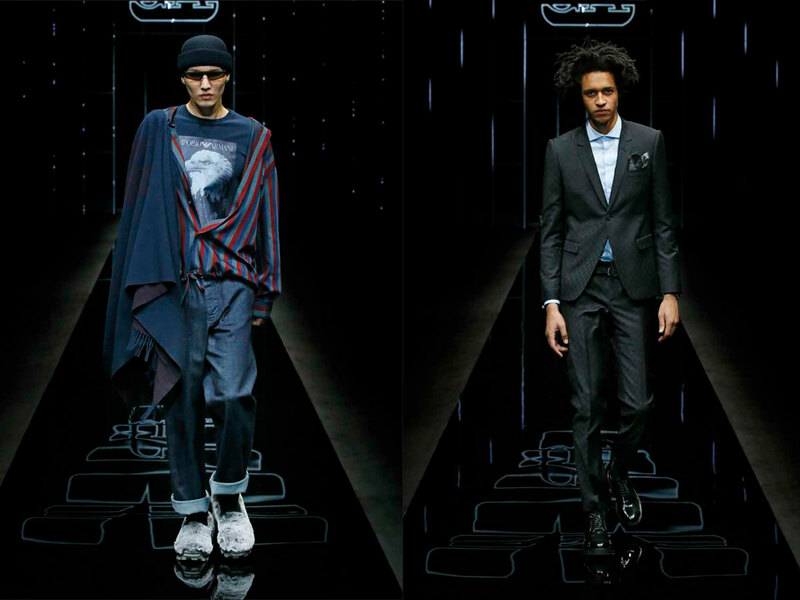 Alessandro Sartori at Zegna Couture proved that point with his “openness and inclusivity” show and Miss Prada with her anger at the current political landscape worldwide through her tailored monster ball men. Giorgio Armani is in his mid 80’s but he still very much has a voice in how our fashion weeks are shaped. So his Friday night invitation to his Silos museum to see the work of French photo artist Charles Fréger was special. First of all the Friday evening of men’s week is becoming busier and busier and Armani allowed us to go home a day earlier by moving his men’s into February as a co-ed show. Yes, many of his competitors have contemporary art showcases or museums but Armani so far has used his mostly as place to exhibit his own work. Not this time, Armani provided a platform for the breathtaking work of Charles Fréger on tribal uniforms from all over the world. Another metaphor for openness. And Mr. Armani himself hosted the exhibit and was very present in person all night long. 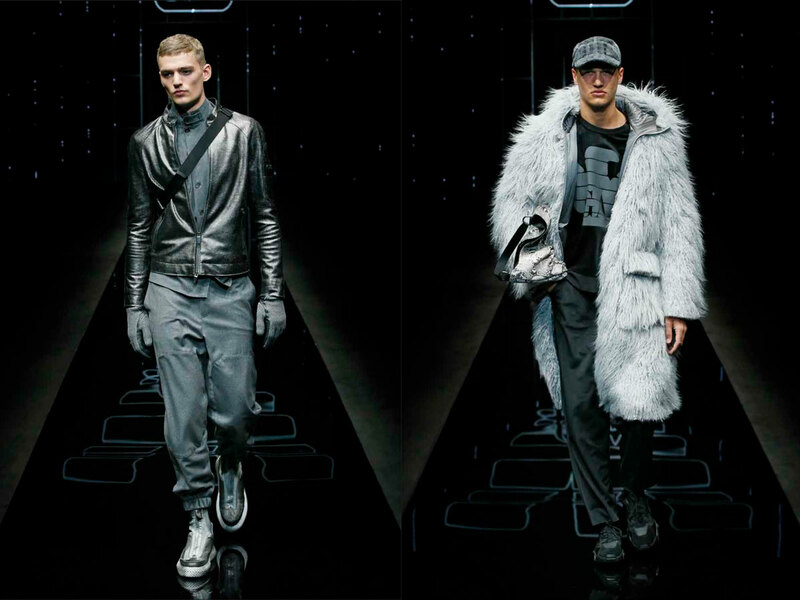 In the same spirit, his new Emporio Armani men’s collection spoke to us. 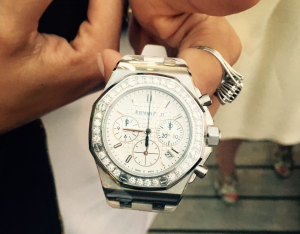 Armani taking risks as in his plunging into the animal world with zebra, python and crocodile patterns all over. Two photographs by the French artist Charles Fréger at the Armani/Silos Exhibit. Ever in love with a natural shoulder, the Emporio man features an even narrower one this season while coats have strong volumes while cuffed pants put a focus on the bottom. Tight cuffed wool pants and a voluminous fake fur coat were contrasting on the runway. 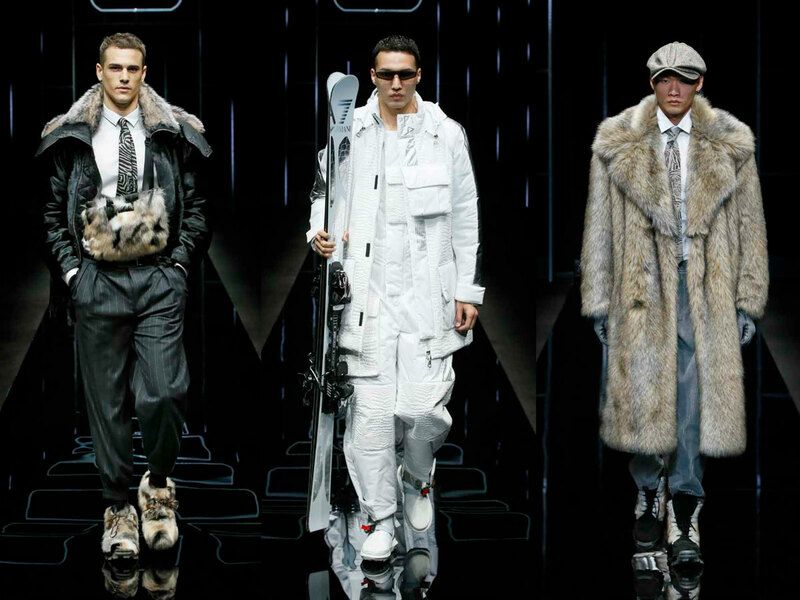 While there is snow all over Europe with seriously chilly temperatures – Austria and the German Alps drowning in snow – Armani’s idea to bring out a super luxe winter sports themed collection to brace the cold in was spot on. Even better his heavy fur theme on coats, parkas, jackets and even shoes was all the better for being faux and not real. Of course, he did not forget to close out the show with his EA7 skies and snowboards and all kinds of logoed skiwear. Fake fur details and all-white skiing wear were featured as signature looks in the show for F/W 2019. With this collection Armani managed to combine business as in the grown –up suit section, country as in all the heavy coats and fur caps, formal as in all the tuxedos plus urban and street elements with his logos. Cool streetwear with big prints and classical black suits both could be seen in the show just a few models apart. Seems like Mr. Armani is happy to be back in the 100 plus look show. Here it was 139, uff.